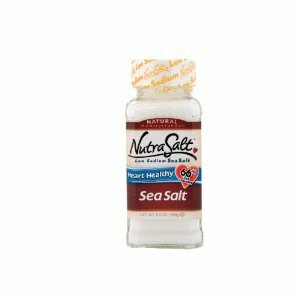 NutraSalt Low Sodium Sea Salt, 5.5-Ounce Containers (Pack of 3) by NutraSalt at Rae Of Sunshine Life. Hurry! Limited time offer. Offer valid only while supplies last. Our low sodium sea salt has the perfect balance of potassium and sodium with trace elements from the red sea and sea salt minerals from the Dead Sea. Our low sodium sea salt has the perfect balance of potassium and sodium with trace elements from the red sea and sea salt minerals from the Dead Sea. This unique combination of Mediterranean sea salts gives Nutrasalt its good salt taste and good health with 66 percent less sodium than any standard table salt or sea salt. Nutrasalt low sodium sea salt can be used in cooking, baking, and as a table sea salt. Replace your high sodium table salt with our low sodium sea salt and enjoy the health benefits today. NutraSalt's proprietary product is harvested from the seas of the Mediterranean region. Natural salts and rich minerals from the Red Sea and Dead Sea, known for its healing properties, come together in a line of salts and seasonings that can replace common salt 1:1 in any recipe or on the tabletop. If you have any questions about this product by NutraSalt, contact us by completing and submitting the form below. If you are looking for a specif part number, please include it with your message. Pink Salt, Deep Secret Pink Salt (Fine), 100% Pure Natural Gourmet Salt, Bbq(barbeque) Salt, Seasoning Salt, Mt Andes Bolivia Pink Salt. Sadaf Himalayan Pink Salt, Reusable Bag, Coarse Grain Crystals, 1 lb.